Sometimes you end up having fascinating insights into your children’s thinking. Lately, Master I has been pondering finance. Frustrated, Master I decided he definitely needed some paper money. The Australian type that could be traded for lego. How can I get money, Mum, he asked? Well, you have to work for it, I responded. You don’t work for it, he said, you just go to the bank and get money out. Touche. No, you don’t. You need a card. Maybe I should get a plastic card. If I had a plastic card then I could get money out. Six year old logic is hard to argue with. No, money needs to exist first, BEFORE you can spend it. I didn’t think it was a good time to introduce the concept of credit. But the bank has lots of money. Can’t we just take that money? he asks. At this juncture I should point out that the bank means the ATM. No, that’s called stealing. It’s also illegal. The way it happens is this: you work, you earn money, you get to spend a bit of that money. The penny (or dollar or rupiah) drops and an incredulous Master I, says, You have to work first for money? You have to actually do work for it? Yes! And you can do certain jobs around the house and Daddy and I will pay you for them IF you do a good job. If you do all your jobs you can earn $5 a fortnight. $5! No, I think $100 a fortnight would be much better. I like $100 notes much more than $5 notes. Yes, so do I. But I can’t give you $100 a fortnight. But I want it to buy lego. Being a kid is SO boring. Being a kid is the best time of your life. It’s much more fun than being an adult. Okay. I still want to be a kid. I just want to be a kid with lots of paper money. 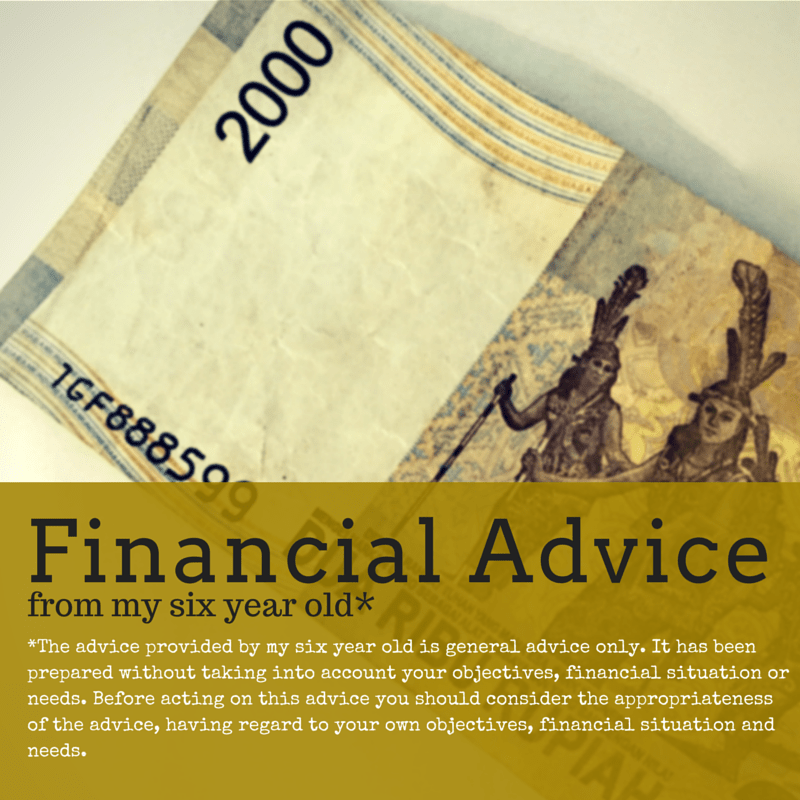 Do your kids have financial advice to offer? Ha ha my kids are right into money at the moment and asking everyone for it! Including their aunties and my parents, they don’t quite ‘get it’ yet. My son knows its a means to an ends. And that ends is lego. That’s about it. Ah, wouldn’t it be grand? I had an interesting conversation with my 9yo nephew explaining the concept of housing affordability in Sydney versus the country (where he lives) after I copped a shitbagging from about the fact that I live in a unit. ‘Why don’t I just get a house?’. yeah, ok, sure. Sheesh. I wish the money world worked the way kids think it does – you want it, you buy it. I am sure when he is older he will cringe at that comment!